Herbs, perennial, to 100 cm; rhizomes coarse; stolons absent; corms absent. Leaves submersed or emersed; submersed leaves phyllodial, angled abaxially, flattened adaxially, 6.4--35 ´ 0.5--4 cm; emersed with petiole triangular, 6.5--17 cm, blade linear to linear-oblanceolate, 2.5--17.4 ´ 0.2--4 cm. Inflorescences racemes or panicles, of 1--12 whorls, emersed, 2.5--21 ´ 1--8 cm; peduncles 6.5--29.7 cm; bracts connate more than to equal to ¼ total length, broadly subulate to lanceolate, 20--50 mm, coarse, not papillose; fruiting pedicels spreading, cylindric, 0.5--5 cm. Flowers to 2.3 cm diam. ; sepals recurved to spreading, not enclosing flower; filaments dilated, shorter than anthers, pubescent; pistillate flowers pedicellate, without ring of sterile stamens. Fruiting heads 0.6--1.5 cm diam. ; achenes oblanceoloid, without abaxial keel, 1.5--2.8 ´ 1.1--1.5 mm, beaked; faces not tuberculate, abaxial wings 0--1, ± entire, glands 1--2; beak lateral, erect, 0.2 mm. Seven varieties of Sagittaria graminea have been recognized, i.e., var. graminea, var. platyphylla Engelmann, var. teres (S. Watson) Bogin, var. weatherbiana Fernald, var. cristata (Engelmann) Bogin, var. 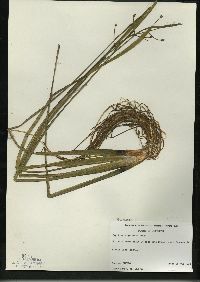 chapmanii J. G. Smith, and var. macrocarpa (J. G. Smith) Bogin (C. Bogin 1955). We accept only one infraspecific rank, i.e., subspecies. Consequently, we have made the appropriate combinations. We accept all of the taxa accepted by Bogin at the varietal level. At specific level we accept Bogin´s var. platyphylla, var. teres, and var. cristata and at subspecific level his var. graminea, var. chapmanii, and var. weatherbiana. 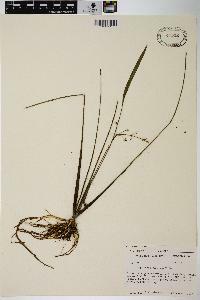 Sagittaria graminea var. macrocarpa actually is synonymous with var. 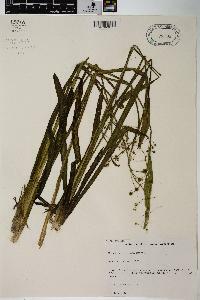 graminea (E. O. Beal 1960b). We therefore are following Beal in recognizing var. macrocarpa sensu Bogin as S. fasciculata. We also accept var. platyphylla, var. teres, and var. cristata at the specific level, leaving only three subspecies. These subspecies can be separated by the branching of the inflorescence and the length of pistillate pedicels. Perennial aquatic herb to 1 m tall Leaves: submersed or emersed. Submersed leaves are 6.4 - 35 cm long, 0.5 - 10 cm wide, and linear. Emersed leaves on triangular stalks 6.5 - 17 cm long, with linear to egg-shaped or elliptic blade 2.5 - 17.4 cm long and 0.2 - 4 cm wide. Inflorescence: emersed, singly stalked along a central axis (raceme), or with loosely branched stalks (panicle), 2.5 - 21 cm long, 1 - 8 cm wide, arising from a stalk 3 - 50 cm long, with one to twelve whorls of flowers. Flowers: either male or female, found on the same plant (monoecious), to 2.3 cm wide, with a stalk longer than 1 cm, three recurved to spreading sepals 3 - 6 mm long, and three white or pink petals 1 - 2 cm long. Male flowers are borne near the top of the inflorescence, having scaly filaments shorter than the anthers. 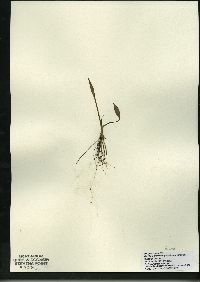 Female flowers found near bottom of inflorescence, with spreading fruiting stalks 0.5 - 5 cm long. Fruit: a cluster of achenes 0.6 - 1.5 cm wide. Each achene is 1.5 - 3 mm long, 1.1 - 1.5 mm wide, narrow and inversely egg-shaped, with a horizontal beak 0.1 - 0.3 mm long. Bracts: 3 - 15 mm long, broadly awl-shaped to lance-shaped, coarse, fused at least one-quarter the length. Similar species: Sagittaria rigida and Sagittaria graminea almost always lack the arrowhead-shaped leaves of the other Sagittaria species growing in the Chicago Region. Both species nearly always have linear to lance-shaped or narrow egg-shaped leaves as well as flowers with scaly filaments. Sagittaria rigida is often bent at the lowest whorl of the inflorescence stalk, the female flowers are stalkless or very short-stalked, and the achenes have beaks that are usually longer than 0.8 mm. Habitat and ecology: Frequent in shallow water of ponds and swamps, growing in mud or sand. Etymology: Sagittaria comes from the Latin word sagitta, meaning arrow, referring to the leaf shape. 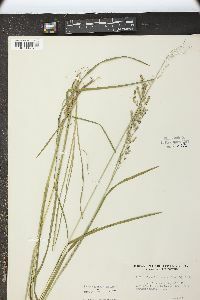 Graminea refers to its resemblance to a grass. Erect and emersed or lax and submersed; rhizome short; lvs bladeless, flat, phyllodial, or with lance-linear to broadly elliptic-ovate blade, very rarely hastate or sagittate, 4-30 נ0.5-10 cm; scape simple or sometimes branched at the base of the infl, 0.3-5 dm; fls in 2-12 whorls, the upper usually staminate on slender, erect pedicels, the lower pistillate on thicker, ascending pedicels; bracts 3-15 mm, connate up to half-length; sep ovate, 3-6 mm, reflexed in fr; pet white or pink, 1-2 cm, often as wide; stamens 12-many; filaments dilated, roughened with minute scales; achenes 1.2-3 mm, winged on the margins and with one or more facial wings, the beak less than 0.75 mm; 2n=22. Swamps, mud, and shallow water; Nf. and s. Lab. to Minn. and S.D., s. to Cuba and Tex. July-Sept. Three vars. with us.